Easy-to-use and clear mapping to 8 superb walks centred on Grassington in the Yorkshire Dales. Great Britain Mountain Biking is a comprehensive area-by-area guide to the best places to ride mountain bikes in England, Scotland and Wales. An inspirational guidebook to 50 memorable expeditions throughout the Pennines, the iconic backbone of England. These circular walks are all graded, making this guidebook equally suitable for first-time and more experienced walkers looking for new corners of the North Pennines, Howgills, Yorkshire Dales, South Pennines and Dark Peak. Discover the beautiful countryside around North Yorkshire with this guide to some of the best walks in the county. essentials - in the UK, Europe and beyond. Valleys, based around Harrogate, Knaresborough, Wetherby and Tadcaster. A perfect map to explore this wonderful walking area in the Yorkshire Dales - 8 walks in mid-Wensleydale and Lower Bishopdale. Pennine Way South covers the route from Edale to Horton-in-Ribblesdale. A perfect map to explore in and around Reeth - 8 fabulous walks centred on this lovely Swaledale village. Perfect map to explore the fabulous walking area of Upper Swaledale - 8 walks centred around Keld, Muker and Gunnerside. This North York Moors map is a welcome addition to the range of British Mountain Maps published by Harvey Maps in conjunction with the BMC. The Cleveland Way runs for 174km (109 miles) from Helmsley across the North York Moors National Park to Saltburn and along the coast via Scarborough ending at Filey and this is the perfect map for your adventure. A leap forward in technical excellence. Tough, light and 100% waterproof. This map covers the EASTERN section from Keld to Robin Hood's Bay and includes alternative routes. A leap forward in technical excellence. Tough, light and 100% waterproof. This map covers the WESTERN section from St Bees to Keld and includes alternative routes. Pennine Way North covers the route from Greenhead to Kirk Yetholm. This book contains routes which are suitable for walkers of all abilites and to suit all tastes, and represent the ideal guide to trekking in the UK. 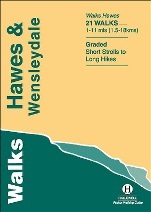 They are compact (A6: 105 x 148mm), light, inexpensive, describe between 20 and 40 walks and are 32 or 40 pages in length. This is Book 20 in the exciting new series of full-colour 'Pocket Walks', being small, practical sized guidebooks aimed at the less serious rambler. Full colour photographs and colourful sketch maps accompany each of the well described walks, with the bonus of making it an attractive souvenir of the area.